Everyone loves the leftover turkey sandwich. It is always a good tasty easy meal to have after some serious revelry. My favourite way to dress up mine is by quickly making up some cranberry mayo. So very easy and so very tasty. This is also good on a chicken breast sandwich or even better used in making a turkey salad or chicken salad sandwich. Oh so good! 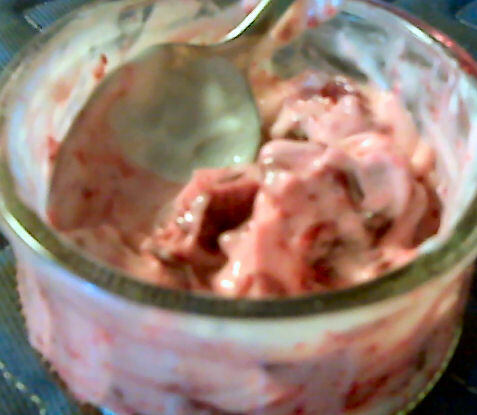 Combine the berries and sweetener of your choice in a small microwaveable dish. Cover (leaving a steam vent open) and microwave for 1 minute. Stir the berries, if they have lost their shape they are ready. If not zap them in 30 second rounds until they have. Allow to cool then add the miracle whip. You are ready for sandwich action. Makes one generous serving. Contains about 28 calories, 0.3 grams of fat, and 2 grams of fiber if you used splenda. Count on a bit more calories if you used sugar, shouldn’t be much more though. Curious about what my leftover sandwich platter looks like? Mmmm, now that’s a sandwich! 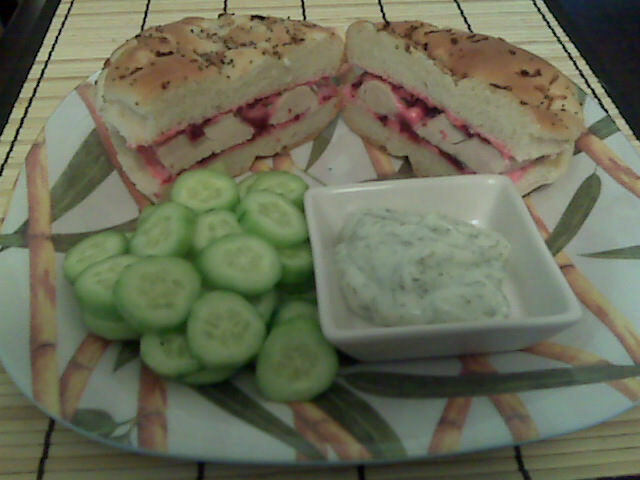 I have a nice poppy seed onion bun, 2 ounces of turkey, my cranmayo, a couple of mini cucumbers, and my rancho dill dip that I mentioned in my dippers, dinning in, and dives post. Mmmm tasty lunch. It would have been nice to have some lettuce on that sandwich but sadly we had a huge salad with our turkey dinner that was devoured. We are shockingly lettuceless! This entry was posted in Ingredient, Lunch and tagged sauce. Bookmark the permalink.